It has been an amusing start to the year (she writes whilst grimacing). I did that creative thing of spending some of the Christmas break thinking about projects and plans which meant I started the new year with a lovely floaty 'let's do this' feeling. But, by the end of January, the enthusiasm had dipped somewhat. The issue with freelance work is that it doesn't stop when you do, so January was always going to be hectic but then a few pieces of work overran and some sort of virusy thing lingered over the house. So here I am, second week of February and finally feeling like I am back in my groove - hurrah! Knowing that the diary was going to be full I only slotted in one new class - which is a sampler that I always love teaching. 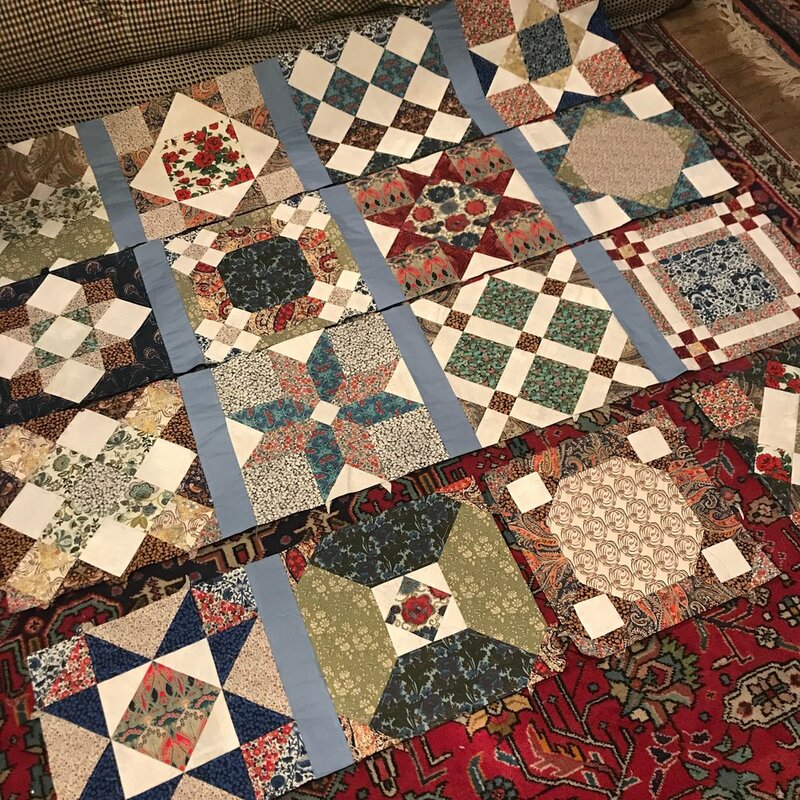 I also have my regular Sunday sessions at Brighton Sewing Centre which have been running for a few years and attract a mix of beginners who want learn the quilting basics, as well as returners who bring along something to work on. Below are some of the things the students have worked on over the last two months - impressive eh?! In the third week of January I went to the Ardingly Quilt Show. Living in Brighton it is rude not to as it is the biggest quilt show close to here. I went with quilty friend Carolyn and enjoyed looking around, although did save some money by thinking it opened till 4.30 on the Saturday, when it actually closed at 4pm - and no notice was given which curbed the shopping somewhat. My favourite quilt on display was Heart of the Peak, by Mike Fitchett (below). I recalled seeing it at the Festival of Quilts in 2016 (I think) and love how the shapes look so simple and ordered, but when you look at the careful addition of the shadows and lines of quilting you spot how it is so cleverly designed. Eye-catching, and a quilt I would love to have on the wall. I have also been doing a lot of reading, partly as a cure for the winter days, but also as research some new illustrative work. Having never read Wuthering Heights I thought it would be a good book to start the year but had no idea quite how bleak it could be, and at one stage nearly put it to one side. At the end, I was so so pleased I didn't, and couldn't stop thinking about it for days after. About 10 years ago I visited Haworth with my family on a cold wintery day. As the bus got further up the hill from Hebden Bridge the snow got thicker and thicker and by the time we reached the village it was almost impassable. However, the bus continued as there was no way back down. The museum was still open, and crunching through the snow while exploring the village gave a wonderful feeling of how remote the location was. On the flip side, I know the wider area fairly well as my brother lived nearby, and he drove through the snow to 'rescue us'. This local knowledge meant I did read the book and thought 'Cathy, go and hang out in Halifax or Bradford and meet some new folk'. But, that wouldn't have made such a gripping novel..!